Quantic Dream has a rocky history when it comes to video games. While I loved Heavy Rain and liked what I did play of Beyond: Two Souls(Which failed to keep my attention by what I assume was close to the halfway point. ), I can’t deny that there were faults in their presentation. But they’re faults introduced by the style of game that Quantic Dream and director David Cage have spent over a decade trying to perfect. And in the case of Detroit: Become Human, they’re almost there and what faults there are are so miniscule that they hardly detract from the experience. This review will be different from what I normally do because Detroit doesn’t focus on gameplay or the balance between gameplay and narrative. Instead, it focuses heavily on the narrative and uses what gameplay it has as a vehicle for players to impact how events unfold. So there isn’t much to critcize other than the fact that certain motion control QTE’s fall flat because the PS4, half the time, didn’t register the gestures and I had to shake the controller for it to finally pick up. This is only related to ones that make you turn the controller. Any that ask you to simply lift it up, move it down, or side to side, work perfectly fine, and thankfully the problematic ones never come up in a scene that requires you to hit it quickly. Likewise, there are a lot more chase segments and exploration segments that allow you more control over the scene rather than simply watching it. Graphically, the game sets the bar extremely high for console games, being one of the best looking games I’ve ever seen. The combination of effects, texture work, and modeling work elevate everything above and beyond other games on the platform. And yes, it even tops God of War and Horizon: Zero Dawn in the photorealism category. And I have to say, that if the graphics weren’t as lifelike as they are, I wouldn’t have been half as invested in the characters and story as I was. Everything was so believable that it just sucked me in. But now, lets get to the real meat of this review: The stories. I’m going to give each character their own section to discuss their individual stories, because ultimately that is what a Quantic Dream game is about, that’s why I’m here, why I bought it on launch day, and why I’m here writing this review now. So let’s jump into it. The journey of Markus is one of self-discovery. He begins life as the caretaker to an eldery painter who treats him as if he were human, as if he were his son. He constantly pushes Markus to decide for himself who he wants to be. After a tragic series of events, Markus finds himself taking refuge with a group known as Jericho, a safe haven for androids. It is here that the player begins to shape Markus’ journey, who he will inevitably become and what path he will lead the android people down. In Markus’ story, there are two major paths: Violent Revolution and Peaceful Protest. It is up for the player to decide which they feel is the correct path to take, and it isn’t as easy a choice as it may seem. There are consequences regardless of the path, and you have side characters who are like angels and devils on your shoulders, tugging you one way or the other, presenting you with sensible arguments for and against certain decisions. They’re approval of you will increase of decrease depending on your choices, and their feelings towards you can alter the future. There was a moment in the story where a relationship Markus developed with another character that ended up being the very game changer that was needed to win the day. I never realized how something that seemed so small and so personal to the character, could affect the larger world. But that’s what Markus is, a man that once seemed so small and insignificant, but goes on to mean so much more to the world at large. In the end, I cared for Markus as if he were a real person, both outside and inside the world of the game. I felt for him and my decisions were made on impulse. At one point I thought that save-scumming would save me in an instance where every choice I made seemed to lead to death, and so I resigned myself to just do what I felt was right, even if it meant losing the character, and in the end my bet paid off and gave me the ending I had hoped for, even if it came at a cost. A moment earlier in Markus’ story has his owner, Carl, ask him to paint a picture right then and there. At first, you choose something to be your subject, and Markus reproduces a perfect copy. But then, Carl asks you to close your eyes and paint what you see in your mind. It is here that one of many speechless moments came to me. You select two or three dialogue prompts that shape the image in Markus’ mind, and he then paints it on the canvas with your help via QTE’s using the touchpad. The painting then becomes personal to the player, because it represents what the player felt. And there were moments much later in Markus’ story that made me feel like my heart had stopped because they were so impactful, so beautiful, so saddening, and games have rarely ever made me feel that way. I loved Markus’ journey. The acting was superb and believable, though there were a scant few moments where he felt a little devoid of emotion despite the scene calling for something more. And yet, it was presented so well and made me believe in the androids fight for freedom and equality. I will admit that when I first saw Connor’s introduction trailer, I was a bit put off by the character. He seemed stiff, unlikable, and like the protagonist I’d like the least. Boy was I glad to be wrong. 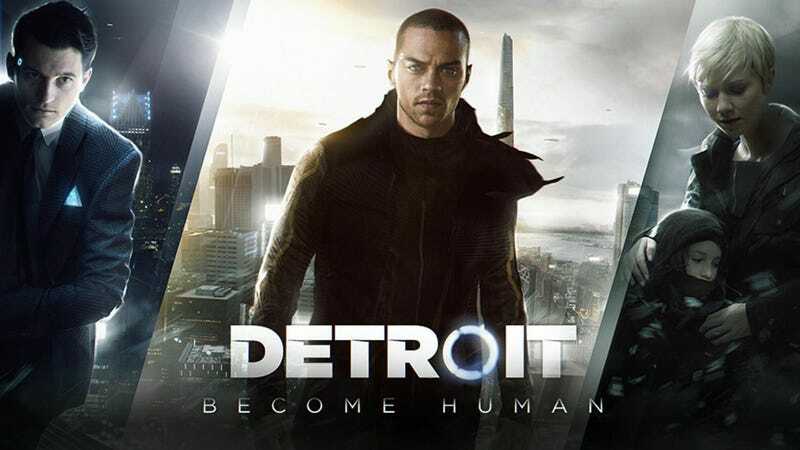 Connor’s character arc puts him opposite of Markus, fighting on the humans side and trying to track down the deviants, trying to end their movement before it can gain ground. In his story, Connor is paired up with Police Lieutenant Hank Anderson, a man who hates androids and has a lot of emotional problems. He and Connor are polar opposites. Connor is an android, through and through, while Hank is as human as they come. The way these two play off of each other is nothing short of genius. Like with Markus and his companions, Connor’s relationship with Hank begins at neutral, but can become something more, or completely go down the drain. By the end of Connor’s role in my story, he and Hank had become friends, and Connor was more human than when he first began. And that is Connor’s journey. Will he resist the calls to be free of his programming? Or will he join his fellow androids? That is for you to decide. However, there is one catch about Connor’s story: He can’t technically die. Like the other protagonists, he can die, even in his introductory chapter he can die. However, he will come back even if he dies. Why? Because he is simply replaced by another Connor model. Since I did not have Connor die in my story whatsoever, I do not know exactly how this impacts the story, but I do understand the reasoning behind it. Unlike Kara and Markus who would not be replaced by Cyberlife if they died due to the nature of their stories and circumstances, Connor is seen as expendable for the greater good, and thus they will keep pumping out a new model each time the current one is destroyed. It fits within the context of the story and, in my opinion, might actually help reinforce player attachment to the character because they would want him to stop dying, to save him, and depending on his relationship with Hank, this may or may not have more of an effect on how the player experiences their tale. After all that I went through with Connor, I regretted having ever doubted the writers ability to create a character that I care about. Connor is no less deserving of the role of protagonist than the others. He’s also more comedic than the other two because his naivety makes it so that he doesn’t understand humans who make irrational decisions not based on logic or probability. So it leads to many moments where he doesn’t understand why people are made at him, or why Hank does the things that he does. Connor’s journey has him learn more about the world, about himself, and about humans and what makes someone human. Like Markus, Kara comes from humble beginnings. She’s a housekeeper model owned by a man named Todd and named by his daughter who loves her very much. However, she was broken by Todd in a fit of rage and sent to be repaired where her memory was wiped and she begins life as if she were a newborn of sorts. However, regardless of how many times her memory is wiped, one thing is clear: She will always love Alice, and that forms the crux of her journey. Unlike Markus and Connor who are combatants and actively involved in the games larger story, Kara is separate from them. She doesn’t want any part of the android revolution or the hunt for deviants, she simply wants to be free and to live with Alice forever. And the actor behind Kara puts in a very emotional and convincing performance that really brings the character to life. Her story about family is a heartwarming one, but it also lets the player make many selfish and sometimes reckless decisions in the pursuit of survival and safety, especially when caring for a small child. One of the earliest segments of the game has you trying to find shelter for the night, and the game gives you at least three options for shelter. Two are easy, one is difficult and requires you to do things Alice will disapprove of, but you may just feel compelled to do it anyway. And that’s what makes her story so amazing. You feel compelled to push onward and protect this child, to do what you feel is best for her... or don’t, and be a terrible mother figure. In my playthrough, I did what I could without crossing the line, and I felt better for it. However, there was one instance where I almost did something horrible, but a feeling of shame washed over me and I stopped myself from going through with it even though it ultimately led me down a path that tore my heart to shreds. Like past Quantic Dream games, Detroit: Become Human focuses all of its strength on its narrative, and while past games may have been a mixed bag, I’m happy to say that Detroit is Quantic Dream’s magnum opus. Throughout the game you’re asked to make decisions that can send ripples throughout the entire game. This is not a story with a fixed ending, where no matter what you do you’ll always end up at the same place. No, players will experience a variety of different endings based upon their actions, and let me tell you now, you will feel emotions you never thought a video game could evoke from you, and those emotions will throw you off the course you plotted for yourself. In my playthrough of the game, I was tortured, constantly, by my emotions. My head told me to make the best choice, but my heart said to do something else. It was the worst possible game of tug o’ war, and it hurt something fierce. The acting, motion capture, and graphics all came together to make me believe everything I was seeing, everything I was hearing, and it just tore me up. I came up against multiple scenes where it seemed like no choice I could possibly make was the right one, but it was believable. I resigned myself to doing what I thought was right, rather than what I thought would lead to the best outcome, and it nearly cost me, but a decision from earlier that could have come back to bite me wound up saving me. It was still a bittersweet scene because I still felt as though I had lost despite getting the best possible outcome. And then, towards the very end of the game, I felt a rush of anger when a character from a previous chapter appeared, but as the scene played out, my anger turned to understanding, and when prompted to prevent something from happening, I let it go because my heart told me it was what I should do. I didn’t let my still very present feeling of contempt for this person rule me, and granted them a chance at redemption, and I felt better about it afterwards. When a game can take a character, make you absolutely despise them in less than 30 minutes, but then turn them around just as fast and make you feel something else, that’s greatness. That isn’t to say there weren’t some moments that I absolutely laughed at because they were so obvious, cliche even, and yet I wasn’t laughing at the game. I was more laughing at the fact that I should have expected that Quantic Dream wouldn’t have let the opportunity pass them by. It was such a classic moment that’s been parodied to hell and back, and yet it made me feel... a bit of a survival instinct I guess you could say. I knew that one false move would end me, and I didn’t learn the requisite information by this point to make surviving easy. So I took a deep breath and trusted my instincts, and I came out of that scene alive, and it was followed by one of the best moments in the game. At the end of the day, I will never regret spending $60 on Detroit: Become Human. Some people may laugh at these “interactive movie” games, but quite frankly I love them because they give me an experience like no other, and Quantic Dream are the masters of it now. The sights, the sounds, the feelings, all come together to create a true work of art and proof that video games can be more than just games. The criticism that Quantic Dream could have just simply sought funding for a movie or TV series rather than make a game feels invalid in the face of this game because a game can run as long as it needs too to tell its story down to the finest detail, whereas TV shows and movies are crammed into manageable timeframes with zero guarantee that the story will ever be finished because it might get canceled before then. But with a game, a 14 hour one at that, everything is right there for you to take at your own pace, and for you to partake in beyond merely viewing it. Only video games can give you that kind of experience. In the end, I shaped the fates of three very different characters, guided them down a path that my heart told me to follow rather than any kind of logic, and it’s only now that I’ve had enough time to think about it, that I solved one of the games biggest mysteries: Who is rA9? And the answer was something I had never considered throughout the entire game, but that’s what makes it so great. It keeps you thinking, keeps you engaged, and never leaves your mind even after you’ve finished the story in any number of ways. From the bottom of my heart, I recommend this game to anyone who owns a PlayStation 4.